Airbus set a company record for deliveries in 2016 with a total of 688 planes leaving its factories for airlines and leasing companies. Commercial aircraft deliveries were up for the fourteenth straight year, an 8 percent increase on 2015’s 635. Airbus had a strong finish for 2016 as supply problems, particularly for new generation engines and cabin interiors, eased late in the year. Of total deliveries, 545 were for A320-family aircraft, including 68 A320neos. Airbus just missed its delivery target on the A350 with 49 handed over. Airbus also delivered its 10,000th aircraft, an A350-900 for Singapore Airlines in October. 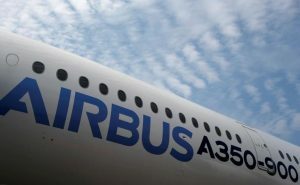 “We delivered on our objectives in a challenging environment, proving our ramp-up readiness for the future,” Airbus COO Fabrice Brégier said. Airbus announced its net order total of 731, with its order backlog of 6,874 aircraft worth over a trillion dollars at list prices. Airbus beat Boeing in net orders, with Boeing’s 668 falling short. In terms of deliveries however, Boeing retained the top spot with 748 against the Airbus total of 688. Boeing has now beaten Airbus in deliveries for the last five years.